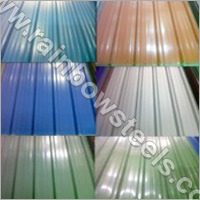 Our colour coated roof sheets are extremely resistant to corrosion and chemicals. In fact, these can resist to chemicals in liquid as well as vapor forms. Flexibility is another feature of these roofing sheets. These can be bent parallel or perpendicular to the corrugation. Since these are light weight, it becomes easy to transport and install them on any establishment.